I came across this in the ULTA check out line and I ended up trading what I was gonna get for this set. First of all, its called "Beauty Blogger Darlings" and I haven't tried any of the products so of course I HAD to get it. Secondly, it was only $20 which in my opinion is a really great deal because a little bit goes a long way with all of these products. 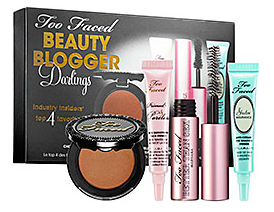 The set comes with a bronzer, foundation primer, mascara, and eye primer. Individually, these are all sold $103, so I think trying these products out with a generous amount is a pretty good deal. 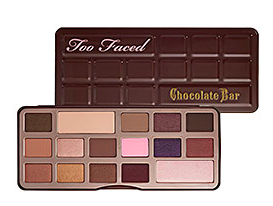 After I saw blogger after blogger rave about this, I decided to try it because I think this palette is unique. It had some colors I'm not used to working with. Not only does it look like a box of chocolates, it actually SMELLS like chocolate. All of these 16 matte and shimmer shadows are infused with real coco powder. I think these eye shadows are really versatile and looks good on every skin tone, every eye color, and has shades for day and night. They are all really pigmented so this palette would last you a long time. Ahhh MAC, whats not to love? This was actually one out of the three first purchases of MAC for me ever recently. I remember YouTube Beauty Vlogger and former MAC makeup artist Jaclyn Hill raved about this blush. I went into the store and I asked what the consultant what blush she thinks is the best and she said Melba! This blush is a beautiful very light matte peachy pink shade but just looks like a pale pink in the container. I love this blush and it truly goes well with all skin tones. 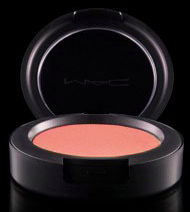 If you have are interested in MAC blushes this is the one you need. That's it for my Friday Favorites, I hope everyone has a great weekend!